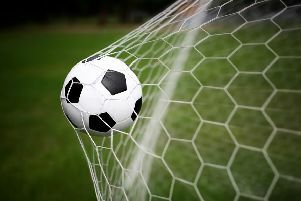 There were contrasting fortunes for our two local SCFL division-two sides this week, with Bosham heavily beaten at Clymping but Sidlesham cementing their spot near the top with a win at Jarvis Brook. Bosham took the relatively-short journey to the home of Littlehampton Town to take on Clymping – and were put to the sword by a Blues side desperate to find form near the foot of the table. The Reds started brightly on a cold afternoon and after only a few minutes, Lewis Brailey rapped the hands of hosts’ keeper Dean Brook-Marsh, who stood tall to make a comfortable save. On only seven minutes the Blues took the lead through Tom Foxon. Bosham failed to deal with a corner and Foxon was in the right place at the right time to poke in at the back stick. Bosham regrouped and the pace of Grant Radmore was causing problems for Clymping but the final ball was letting the Reds down and chances came and went for the visitors. Just after the half hour Bosham levelled. Brailey got clear down the left and fired in a low drive to which Graeme Dowden got his right boot to divert it into the bottom corner. Late in the half Radmore’s volley went over. Then Clymping manager Daniel Lawrence was ordered from the home dugout by referee Philip Wilkes – but deep in injury time Foxon restored the lead for the Blues with a cool finish as the Reds defence split wide open. Bosham had been forced into several changes from last week’s win over Jarvis Brook and it showed as Foxon and Jordan Vaza caused havoc in the Reds back-line as the hosts picked Bosham to pieces. They soon had a third goal to celebrate with Foxon nailing his hat-trick just before the hour as he punished a sloppy free-kick. Minutes later and it was four as Bosham capitulated again with Ben Adfield marching through and beating new keeper Lloyd Thomas with ease. Bosham replied when Dowden converted a spot-kick to reduce the deficit but Clymping remorselessly punished mistakes made by the Reds to stretch away in the final quarter of the game and record their best win against last season’s champions. Foxon grabbed his fourth of the game with a deft header back across the six-yard box and into the corner then a short time later he scored from another free kick, firing past Thomas’s near post to grab his fifth. With minutes to go Bosham’s Callum Coker lost his head and was shown red along with Clymping’s Karn Moore to leave a sour taste – before the home fans were able to celebrate a seventh goal before the end thanks to the ever-alert Foxon who sealed an amazing double hat-trick with another well-taken finish. Bosham left the field shellshocked and will have to dust themselves down quickly before the trip to Upper Beeding. Bosham: Thomas, Neal, Smith, Hardman, James, Bell, Wilson, Dowden, Coker, Brailey, Radmore. Subs: Bulbeck, Lafferty, Jepson, Lidster, Spicer. This had all the makings of a competitive game, and didn’t disappoint. In the fifth minute Harry Gregory burst through after being put away by Dan Bassil and produced a good save from the home keeper. Dan Bassil went close after turning his marker and firing just wide. Callum Dowdell gave Sids the lead shortly after with a good strike after running on to a Bassil header after a Connor Kelly goal kick. Gregory went close after a good cross from Dale Hayes, then Liam Bush tried his luck from long distance. With both wingers for Sidlesham having fine games, Brook had to stand strong. In the second half Sidlesham got their second when a superb pass from Bush found Ryan Hillier and he controlled it and dispatched it into the corner. Brook threw everything at the away side but good defending and steady goalkeeping saw Sids deal with most attacks. Bush went clean through but the keeper again produced a fine save, as he did when after Dowdell crossed and a defender almost knock it past him for a own goal. Brook did get one back before Bassil completed the afternoon’s work firing home after a pass from Joe Bennett. This fine win sets up Sids for Saturday’s home game against Cowfold (2pm) at the Memorial Ground.